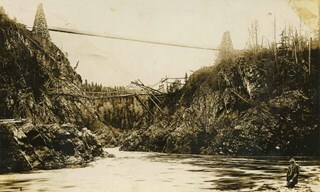 Photograph of a suspension bridge built above a river at a location identified as near Hazelton, BC. A caption included with this picture reads: "Bridge built by Indians at Hazelton." An unidentified man can be seen in the foreground. 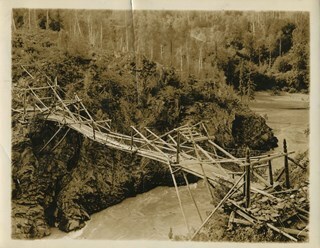 Photograph of a suspension bridge built above a river at a location identified as near Hazelton, BC. A caption included with this picture reads: "Bridge built by Indians at Hazelton."